On Sunday, 26th February 1967, the first edition of the now familiar journal of local events – "Lucan Newsletter" – appeared. Having its origins in "Nuacht na Sáirséalaigh", a broadsheet produced by Lucan Sarsfields GAA Club, containing reports on local events as well as news of Sarsfields’ activities, Lucan Newsletter undertook to cover all aspects of life in Lucan. The function of the Newsletter was, and still is, to provide a platform for the various organisations of the area to publish news of their forthcoming activities and to report on their meetings. The Newsletter has never been short of volunteers as people give of their time freely every Thursday, typing and printing, while on Fridays, our ‘delivery people’ along with the help of some second level students organise the distribution operation to the various outlets in the area. Lucan Newsletter is under the management of St. Mary’s Parish, and the entire production takes place in St. Mary’s Parish Centre. 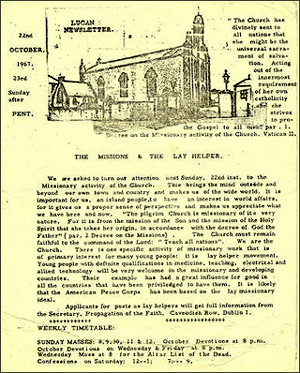 In 2001 Lucan Newsletter went on line, resulting in a worldwide distribution. The feedback from all corners of the world has been tremendous.